Suddenly peace has broken out. It is a little surprising as only last night men who had donned militia combat slacks during Lebanon’s 1975-1990 civil war were sat around a conference table in a luxury Doha establishment in their tailor made suits and bickering over how to form the next national unity government and the shape of the 2009 electoral law. It looked like the stalemate would continue but today at around 10:30am the rival politicians announced their agreement in a televised ceremony. At home, the Lebanese are temporarily confused: Shoo? What? You actually agreed? The deal leans toward being a minor victory for Shiite Hizbullah, who didn’t really make any concessions to the ruling March 14 Coalition during the five days of negotiations. As for the shape of the new government, Hizbullah got 11 ministers, thereby securing their long-standing demand for veto-power. The majority got 16 ministers and the new president gets three. After the opposition announced that as part of the deal, they would remove their camp-city sit-in, the Lebanese elite got their Downtown back: now they can get back to shopping at Marc Jacobs and Elie Saab until they drop. And all the Lebanese will get a President when Michel Suleiman is elected on Sunday. But as we are all being reminded, this happy period of political agreement may soon be over: in 2009, the government will resign by default after the Spring elections are held. That may actually be the reason the majority finally agreed to Hizbullah’s veto demand- they would never have capitulated had they known it was for a longer period. And the majority has not forgotten their humiliation at the hands of Hizbullah’s superior military force. One thing is certain: Samir Geagea, Amin Gemayel and Saad Al-Hariri will stick to their guns (which despite their efforts, it is widely known they have) and continue to look for foreign help in confronting Hizbullah’s arms. And it is highly likely that once the politicians return to Beirut, so will their disputes. The real winner in this whole performance is Qatar: they’ve managed to pull the Arab diplomatic success story of the year that might just bump the Saudi’s off the regional superpower list and pave the way for a bigger Qatari role as a mediator in the Middle East. I’m having trouble seeing the screen today as I went to the opticians and he temporarily blinded me with eye drops that make your pupils expand enormously. I look like crazy-eyed (I imagine, because I can’t really see myself in the mirror. It’s a miracle I’m actually writing this.) Having to walk home was quite a challenge and I almost stumbled over a soldier: I’m glad he didn’t get a good look at me and mistake me for a drug addict otherwise I might have been shipped off to Baabda women’s prison, a merciless place so grotesque I think I’d rather choose suicide. For an informative read on the conditions of women’s prisons in Lebanon, read this article. It may be Now Lebanon, but the author’s work in general is excellent, especially as she doesn’t insert into her work her personal political views at every given opportunity. She deserves to be read. I am one of those dual nationality folks who most unfortunately cannot speak their own language. Despite having an Arab father, the only time he ever spoke to me in Arabic was when I had angered him and he chased me around the house brandishing a shibshib (flip flop), likening me to various animals (donkeys and monkeys stick out the most). I thus had to learn Arabic at university, which means I just about mastered “Hi, hows it going?” and “One falafel please”. For years I have been looking for a bilingual English/Arabic book of stories to help me along in my pursuit of fluency, but to my great disappointment never found one. I do have a dual language Bible, but I’m not finding it terribly useful in daily life, especially as I keep unintentionally referring to it as the Kitab al–Makdoos (the Pickled Bible) rather than the Kitab al–Mukadas (the Holy Bible), which one could argue is actually more correct. 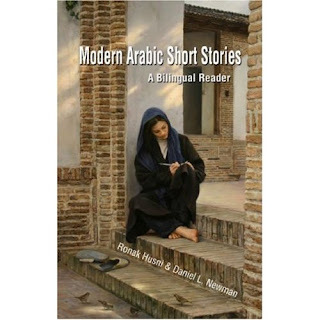 To my great joy, however, the ever esteemed SAQI publishers has just come out with Modern Arabic Short Stories: A Bilingual Reader by Daniel L. Newman and Ronak Husni (May 1 2008). SAQI is always an excellent source for books on and fiction from the Arab world and minorites. Another source from the Economist, showing alliances of political parties in Lebanon. Quite useful resource if your unsure about who’s who. Excellent article too (except for one mistake- they say six Shiite MPs resigned from govt in November 2006. It was actually five Shiites and one Christian). NAHR AL-BARED in Lebanon was a wind-blown huddle of tents when the first refugees straggled here from Galilee in 1948, the year of the Palestinian nakba or catastrophe. Yet the camp somehow prospered, in spite of the Lebanese laws restricting Palestinians, and despite the influx of yet more refugees during Lebanon’s 1975-90 civil war. By last year it had grown into a crowded but congenial town of 35,000, complete with apartment blocks, schools and clinics. The seaside camp was home to the busiest market in northern Lebanon, but also to a growing band of dour, bearded and fearsomely well-armed Islamist radicals. They hailed mostly not from Palestine but from Saudi Arabia, Iraq, Syria and other countries that were making life difficult for jihad-obsessed Sunni militants. Nahr al-Bared’s regular residents tended to shun them. But there was little they could do to keep the 500 or so newcomers out. The feeble Lebanese state takes no responsibility for its 12 Palestinian camps, and the refugees’ own institutions have weakened with the decline of the once-dominant Palestine Liberation Organisation (PLO). 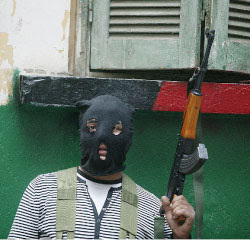 Last May police in the nearby city of Tripoli clashed with members of the group. Their comrades took revenge by attacking Lebanese army posts, then retreated into Nahr al-Bared. Worried by the addition of al-Qaeda-style radicals to Lebanon’s boiling sectarian stew, the army responded with fury. Its siege of Nahr al-Bared lasted 106 days, during which the camp’s entire population was forced to flee and watch their homes being pounded into dust by artillery fire. By the time the Lebanese army declared victory in September, some 47 civilians, 167 Lebanese soldiers and a claimed 287 armed guerrillas were dead. The camp is slowly reviving. Ten thousand residents have returned to the less damaged outlying areas. The owner of a makeshift café on the rutted main street has painted a jaunty sign in rainbow colours. 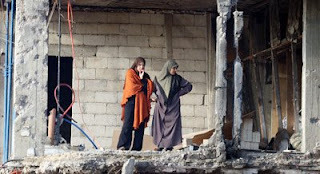 “We Shall Rebuild Al Bared and We Shall Return To Palestine”, it promises. Yet the utterly flattened centre of the camp, which housed 20,000 refugees, remains off-limits. Yasser al-Hajj, a 27-year-old engineer whose family came here from Safad in northern Palestine (now part of Israel), takes a break from shovelling rubble out of a friend’s wall-less living room to point towards one of a dozen tilted stacks of collapsed concrete that loom just beyond a Lebanese army checkpoint. The four-storey building contained all his extended family’s belongings, as well as their wholesale grocery business, the fruit of 60 years’ struggle in exile. Mr al-Hajj assumes they have lost everything. “This is my generation’s nakba,” he says dryly. Such bitterness is widely shared among the world’s 10m Palestinians, 70% of whom are refugees or their descendants. Other peoples have suffered great tragedies, but the Palestinians’ trauma not only refuses to reach closure, it has a horrible habit of repeating itself. Worse yet, its effects continue to poison politics within the wider region and beyond. In annual polling over the past six years, three-quarters of Arabs consistently place the issue of Palestine among their priorities. In other words, little has changed since 1948, when street sentiment prompted five reluctant Arab governments to send troops on a vain mission to block the creation of Israel. During the ensuing war, the Palestinians’ initial nakba, more than half the native population of Palestine, some 750,000 people, fled or were driven from the territory that became the Jewish state, whose troops then barred their return and systematically razed 531 of their ancestral villages. The six-day war in June 1967 brought the remaining 22% of historic Palestine under Israeli rule, and pushed out 250,000 more refugees. In exile, Palestinians have been harassed, attacked or chased away. PLO fighters were forced to flee Jordan after an uprising in 1970. Lebanese Christians destroyed the camps of Tel Zaatar and Qarantina in the 1970s, and massacred Palestinians at Sabra and Chatila in 1982. Israelis besieged the PLO in Beirut the same year, sending PLO leaders to secondary exile in Tunis, and the Syrians did the same in Tripoli in 1984. In 1991 300,000 Palestinians, many of them wealthy and long-settled, were hounded from Kuwait after their leaders foolishly praised Saddam Hussein’s invasion of the Gulf emirate. Libya’s erratic ruler, Muammar Qaddafi, deported thousands more in the 1990s, saying that since they had signed the Oslo peace accords with Israel, Palestinians should “go home”. Since the invasion of Iraq in 2003, nearly all its 20,000 Palestinians have been forced to the borders, where some still languish in dusty desert camps. It is a testimony to the tenacity of Palestinians that they have kept alive a sense of nationhood in the face of so much adversity. Yet the obstacles to sustaining their cohesiveness as a people are today greater than ever. Around 5m Palestinians live in historic Palestine, under Israeli control. In the West Bank, Israeli settlements and military zones take up 40% of the land. In response to the second Palestinian intifada, or uprising, that began in 2000, Israel laced the territory with walls, fences and checkpoints that box its 2.5m Palestinian residents into dozens of largely separate enclaves. Since the Islamist party, Hamas, took control of Gaza last June, its 1.5m people have been confined within the strip’s 146 square miles (378 sq km), kept alive on a drip-feed sustenance of international aid. The 1.1m Palestinians inside Israel are far better off, though they have long suffered legal and economic discrimination. They are increasingly isolated from their brethren. Israel bars them, as its citizens, from travelling to Gaza or to most Arab countries, and their cousins in the occupied territories are unable to visit them since Israel, to keep suicide bombers out, has cancelled most permits. Right-wing Jewish Israeli politicians stir up rhetoric about Palestinian Israelis as “fifth columnists”. Small wonder that in a recent poll 62% of them expressed the fear that Israel would one day expel them. The 250,000 Palestinian residents of East Jerusalem, which Israel annexed in 1967, have Israeli residence permits. But if they move to the West Bank or travel abroad to work, they risk losing for ever their right to live in the city of their birth. Outside historic Palestine the picture is mixed. 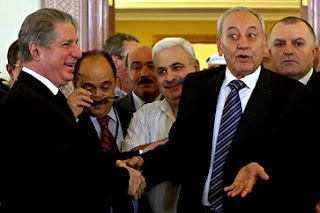 Most Palestinians in Jordan enjoy Jordanian citizenship and hence relative freedom, though their voting power is diluted by blatant gerrymandering in favour of “East Bankers”, the original Jordanians. Lebanon, Syria and Egypt grant Palestinians not passports but a laissez-passer that immigration officers tend to regard with suspicion. That aside, Syria, with its pan-Arab Baathist ideology, gives its 450,000 Palestinians almost all the rights of citizens except the right to vote, which is not much use in a dictatorship anyhow. By contrast, Lebanon, out of fears that naturalising the country’s 350,000 Palestinians, most of them Sunni Muslims, would tip the delicate sectarian power balance, denies them the right to own property or to work in dozens of white-collar professions. Even if they are third-generation refugees in Lebanon, they risk losing their right to re-entry if they stay abroad longer than six months. Ironically, it is Palestinians in the farther shattat or diaspora, beyond the Arab world, who feel the most secure. Antonio Saca, the president of El Salvador, is one of the 100,000 Salvadoreans of Palestinian origin, most of them Bethlehemites who left to escape the collapsing Ottoman empire almost a century ago. There are at least 300,000 Palestinian-Chileans, composed of various waves of emigration. America has maybe a quarter of a million Palestinians, mostly middle-class professionals, and there is a similar-sized but more recent émigré population in Europe, where it has been easier for new exiles to find refuge. Distance and borders are not the only things that divide Palestinians. There are also stark, and growing, gaps between rich and poor, between secularists, Muslims and Christians, between myriad political factions—and between refugees, non-refugees and ex-refugees. The UN Relief and Works Agency (UNRWA) is responsible for the welfare of the 4.5m registered Palestinian refugees in the Middle East. Around half of the Palestinians in the occupied territories, including most of the people in Gaza, are refugees; about a quarter of Palestinian Israelis also lost their original homes. Living conditions vary enormously. In the West Bank, only about a third of the refugees live in camps, and even there UNRWA tents have long since been replaced by tightly packed slum housing. Refugees are fiercely proud of their status, with even the rich and successful clinging to their identity. They may buy large villas, but often next to the camps. The 20,000 inhabitants of Balata camp, at the edge of the northern West Bank city of Nablus, still speak with the accent of villages in what is now Israel, even if they are second- or third-generation camp-dwellers. When UNRWA offered to buy land to house refugees outside Jenin’s refugee camp after parts of it were flattened by Israeli bulldozers, the residents refused. Similarly, Nahr al-Bared’s homeless residents are lobbying to ensure that when their camp is rebuilt, it will still be sectioned into districts named for the Galilee villages the original refugees came from. In Jordan’s capital, Amman, the rich and often secular Palestinians who live on the hilltops shun the religiously conservative poor whose houses pack the slopes and valleys. West Bank city-dwellers still shudder at the memory of an influx of job-seeking Gazans during the 1990s, before Israel severed links between the territories. The traditionally more affluent Palestinian Christians have been the likeliest to emigrate, becoming an ever smaller minority, and sometimes a persecuted one as militant Islamism has grown in strength. An Israeli prime minister, Golda Meir, famously jibed in 1968 that “there is no such thing as the Palestinian people.” Respectable historians now accept that Palestinian nationhood began to form in the 19th century. But at the time of the nakba their sense of nationhood was still more tenuous than that of the Jews two millennia ago, who went into exile with a dense religious tradition and centuries of biblical self-rule already under their belts. The world’s diverse Palestinian communities are tied together less by history than by the narrative of dispossession and the dream of returning home. For all his failings, Yasser Arafat, who headed the PLO and its dominant faction, the secular Fatah party, from 1969 until his death in 2004, can be credited with maintaining and strengthening the Palestinians’ fragile identity. And he did so while engineering the shift in their aspirations that made peace with Israel a conceptual possibility—a shift from hankering after all-too-tangible lost land to the much more abstract promise of a nation-state, on a much smaller bit of that land. But in 1993 Mr Arafat made what most Palestinians now regard as the error of agreeing to the Oslo peace accords, which gave no firm promise of a Palestinian state in return for the recognition of Israel, and which eventually collapsed after the failure of talks at Camp David in the summer of 2000. Many conflict-weary Palestinians would have been satisfied with simply having a passport and a secure place to call home. But to the poorer refugees, Oslo smelt of a sell-out. As Jewish settlement in the West Bank accelerated, the newly installed Palestinian Authority grew more corrupt and negotiations collapsed into bloodshed, ever more Palestinians rejected Arafat’s brand of nationalism and turned to Hamas. The credo of Hamas, born in 1987 as an offshoot of Egypt’s Muslim Brotherhood, is the recuperation of all of historic Palestine for Islam, though over the years it has come to accept the idea of a “long-term” (several decades, say its leaders) truce with Israel. Hamas built its credibility through social programmes, a reputation for honesty and its rejection of a peace process that it saw biased in Israel’s favour. Many of the Palestinians who voted Hamas into power in the 2006 parliamentary elections did so not because they agreed with its ideology but just because Fatah was so awful. Fatah’s subsequent, American-backed effort to destabilise the new government only added to Hamas’s lustre, and prompted the Islamists to undertake what they regard, with some justification, as a pre-emptive coup in Gaza last summer. Israel’s attempts to suppress Hamas have backfired. The result of its blockade on Gaza is that an opinion poll in February showed the Hamas leader in Gaza, Ismail Haniyeh, beating the Fatah chairman, Mahmoud Abbas, for the presidency for the first time ever. Palestinian deaths since the start of the second intifada stand at over 4,700 and rising, while hundreds of thousands have been impoverished, further hardening attitudes towards Israel. The latest peace talks, launched at Annapolis last November, have changed little on the ground. A growing number of Palestinians seem persuaded that Israel has so entrenched itself in the West Bank that a two-state solution is already out of reach. Around a quarter now say they favour a binational state with equal rights for all—which most Jewish Israelis would never accept. This too is to Hamas’s advantage. Its political opponents base their position on secularism and the two-state idea—and both values are eroding. Rumblings of dissent have emerged from within Fatah too, placing pressure on Mr Abbas to toughen his negotiating stance. “If Abu Mazen [Mr Abbas] agrees to anything without the right of return for all refugees, then there will be an intifada of the refugees,” says Shami Shami, a Fatah member of parliament from the Jenin refugee camp. Talk of the “right of return” sets alarms ringing in Israel: if all the refugees returned, Israel would be swamped and Jews would no longer be a majority. In practice, Mr Shami, like most politicians in Fatah, subscribes to a known formula: the conflict must be resolved along the lines of UN General Assembly Resolution 194 of 1948, which states that “the refugees wishing to return to their homes and live at peace with their neighbours should be permitted to do so at the earliest practicable date,” and decrees that compensation should be paid to the rest. The biggest poll on how many refugees would actually choose to return was done in 2003 by Khalil Shikaki, a leading Palestinian pollster. He asked refugees in the West Bank, Gaza, Jordan and Lebanon if, given the choice, they would go to Israel, go to (or stay in) a Palestinian state, or take citizenship elsewhere. Those who did not go to Israel would get compensation. Overall, 10% said they would want to move to Israel (it was 23% in Lebanon and 5% in Jordan, reflecting the differing conditions of refugees there). Some challenge Mr Shikaki’s findings, partly because he added the stipulation that return would be limited to a quota agreed to by Israel, which would undoubtedly be minuscule: informal figures of 10,000 a year have been bandied about, half the current rate of Jewish immigration. More might opt for return if they felt there was a reasonable chance of getting it. Not that compensation for the rest would be a minor obstacle. The Aix Group, an Israeli-Palestinian-French economic study team, estimates that a fair package of resettlement or rehabilitation for the 4.5m registered refugees would run to between $55 billion and $85 billion. Given the tangled mess of responsibilities, foreign countries would be expected to stump up. At present, though, even a decent settlement over the land, let alone the refugees, looks a very long way away. Mr Abbas, presiding over only part of the putative Palestinian state—and that precariously—is in no position to take the steps that Israel demands of him to implement a peace deal. Ehud Olmert, Israel’s prime minister, cannot concede an inch without incurring the wrath of rightists. The two sides are currently negotiating what the Israelis have already downgraded to a “framework agreement” rather than a full peace deal discussed at Annapolis. The prognosis is poor. But if, against all expectation, they should agree on, say, the exact amount of land that Israel is prepared to relinquish in the West Bank and Gaza, even without specifying the shape of the border, it could make this sad 60th anniversary of the nakba almost celebratory. The Middle East Reporter (by subscription only) reported today a story published in Asharq Al Awsat which said that radical Sunni Islamist groups have begun to organize themselves in an attempt to establish a military coalition to confront Shiite Hizbullah. The setback of Saad al-Hariri’s Future/Mustaqbal movement during the crisis is likely to empower such radical Sunni Islamic groups.